LG V30: can the floating bar measure up to the dual screen? The LG V30 certainly made a splash at the IFA 2017. The highly anticipated smartphone was presented in Berlin and pleasantly surprised attendees with its impeccable design and promising technical specifications. The V30 has discarded the dual screen, which was a key feature of its predecessors, but the brand has integrated a software solution for functionality fanatics. A bold gamble by LG, but has it paid off? Is the LG V30 good for gamers? The V20 still hasn’t arrived in Europe and the V10 will land in a few months. The first V10 was a substantial device: a robust and easy to handle smartphone whose casing was reminiscent of the CAT smartphones. Over time, the V10 discontinued its sporty look in favor of more elegant and refined features. Now, despite its large diagonal length, it’s easy to use with just one hand. However, during development it lost one of its distinctive characteristics: the dual screen. 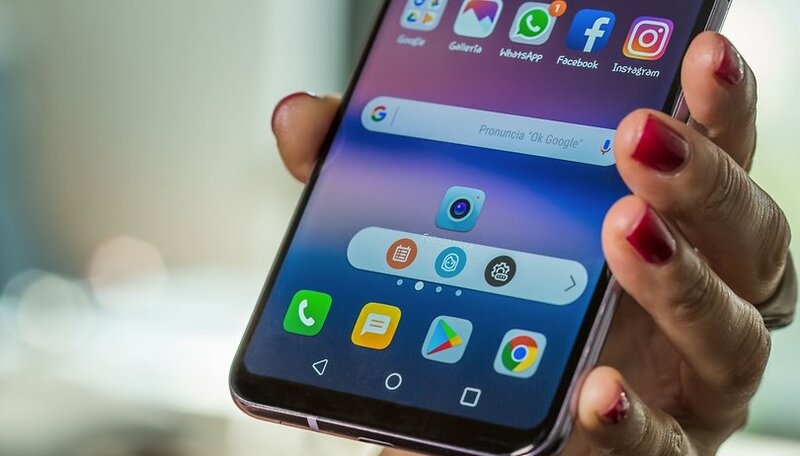 This second screen, placed over the main screen, allows the V10 and V20 to access certain functions, such as settings, the camera, applications and notifications. Customizable with a text message, this screen is always on. However, LG has decided to do away with the second screen on the V30, and I personally think that it was a good choice. Why take up space on the 6-inch 2:1 Full Vision screen? With this type of display, LG wanted to offer the users the option to benefit from the panel without having a bulky device. The second screen would have been virtually useless and isn’t always easy to use with one hand. But LG didn’t want to let down fans of the range and all the users that had gotten used to this special feature on the V10 and V20 devices. The floating bar: alternative software for fans of the dual screen? It’s called the Floating Bar and once activated, you can choose which side of the screen you want to place it on and you can bring it up by tapping an arrow. Through this bar, you can access certain resources which are accessible through the second screen of the V10 and V20 devices. Audio playback, the calendar, the camera and GIF folder are all at your fingertips. This is the alternative for users who love the dual screen on the V10 and V20 devices: a floating bar which can be activated and deactivated (an important detail) in the Settings menu. Your mileage may vary when it comes to how convenient this bar really is. Personally, I don’t think this feature is necessary for the simple reason that the V30 is just as fast without a solution like this. The number of taps it takes to access the camera or other features is identical and switching from one screen to another is extremely fast. I don’t see the bar as a means of saving time or avoiding steps. It is easier to access features than using the second screen on the V10, even though it doesn’t remain activated when the screen is turned off. Note that LG themselves, at least for the aforementioned models, don’t activate this feature by default. However, if the most nostalgic fans of the range need a substitute for the dual screen, they know where to find it: General Settings > Smart Features > Floating Bar. In addition to the Floating Bar, Always On allows you to activate the buttons on the second screen. From this screen, you can launch the camera, activate Bluetooth, turn on the torch (these are the features that I find the most useful on my smartphone), turn off the sound or launch a reminder application. You can also play your favorite songs and see if you’ve received any new messages on WhatsApp or new emails. However, you can’t reply to messages directly through the lock screen, you have to unlock the smartphone first. It's worth noting that, for previous generations of the V range, LG adopted LCD screens which aren’t optimized for Always On mode in the way that we find on the V30. This was further justification for the presence of the second screen. With the transition to OLED technology, Always On became more intelligent and this contributed to rendering the second screen useless. The Galaxy S8 also has Always On mode but it won’t provide access to resources like it does on the V30: to activate the flashlight, for example, you first have to unlock the smartphone. I always activate the Floating Bar on my LG V30 although I must admit that I almost never use it. I think LG has done well to dedicate the entire front panel to a single display. How useful is the Floating Bar? It’s purely subjective. LG decided to integrate it and provide its users with the option to activate it or not. Not all the features included on a phone are meant for every user. Personal use of your smartphone will determine whether the software alternative to the dual screen is worthwhile or not. It's just a quick tap to decide whether you want to use the second screen or not. The usefulness of the Floating Bar depends your personal use of the device. Always On offers excellent support with useful on-screen shortcut keys. Personally I think it’s great that you can scroll through notifications, the shortcut keys and the playlist in the lock screen. A feature that you won’t find on Samsung Galaxy S8/S8+, for example. Choose “Dual screen” or “Floating Bar”. To date this is LG'S best phone. The duel camera's are very good, a 1.6 camera lense. I know it doesn't have the removable battery but the reviewers have stated the 3300mamp battery can go all day & into late evening. The floating bar works well instead of the secondary display which gives you better viewing pleasure. This is sure to compete with the top dogs! The headphone jack remains, ip68 micro s/d expansion. It appears all premium toys included. It's definitely worth a look see! One of the benefits of a third-party launcher is ability to configure and then keep a consistent interface from device to device, instead of dealing with all these "ingenious" stock launchers that not only vary widely between OEMs but that OEMs can't be depended on to provide again for the next model. I've kept exactly the same (perfect for me) interface on five phones and tablets for five years - not going to pimp any particular launcher, several very good ones out there. Damn Always On with toggles for flashlight is pretty handy! Does it work to skip Spotify songs? ?